I have recently discovered your very impressive website as part of my search for information about the DP camp at Dachau and in particular an UNRRA team that was stationed there as the camp was being established in May of 1945. I am co-authoring a memoir with a Holocaust Survivor who, following liberation during a Death March in the vicinity of Bad Nauheim, joined up with an UNRRA team based there and shortly thereafter accompanied them to their new assignment at Dachau, where he served as a driver and general assistant for several months. We are seeking to locate the number of this UNRRA team and the name of its leader, a British woman. She was extraordinarily kind to him and was instrumental in helping him recover from 4 years of deprivation. With her assistance, he was able to avoid being assigned to a DP camp himself. Yet, with the passage of time, he can no longer remember her name, those of other team members or the Team #. In Dannenberg also was a DP camp at least from June to September 1947 with the DPACS number 89 or 89/2510, possibly already before these dates. I have not found a name for this camp in the British National Archives, so perhaps it was a second Oxford camp. Kind regards, Wolfgang Strobel, author of Post der befreiten Zwangsarbeiter - Displaced Persons Mail Paid in Deutschland 1945 - 1949. I am looking for names and information on the students of the Professional Betar School in Darmstadt that existed from 1947-48. The director was Samuel MIlek Batalion and the Betar Instructor was Moshe Mordchelewitz. Most of the students made Aliya to Israel and some stayed in Germany. My mother has remembered that the last camp we were in prior to our departure for Australia was Dedelsdorf in the British Zone. I noticed, by the way, that you have no mention of a camp at Degerloch, a southern (then) suburb of Stuttgart. My recollection of it was that it was a street of weekenders, and in 1946 was occupied by an overflow of Russian Jews from Cannstadt. When my mother joined the Polish Red Cross, we were quartered there for about six months. The fact that I was a Goim didn't matter. Some of the older people - I was fourteen - took me in hand, taught me carpentry and Yiddish - both of which came in handy once I got to Australia. I have an idea that the camp shut down in Autumn 1946, about the time we moved back to Ludwigsburg. What became of the inmates I don't know. "Serving as a transit station for 700 refugees awaiting passage to Palestine, the Deggendorf Jewish Community DP Camp No. 7 was established on February 20, 1945, in Bavaria at the site of a former Nazi concentration camp. Camp money is believed to have been introducd in 1945." From Displaced Persons Camp Money by Frank Passic and Steven A. Feller. It was not established on Febr. 20.1945. Deggendorf was conquered by the 26th YD-Div. at April 27.1945. So the camp must be established May/June 1945!? The camp was not a former Nazi concentrations camp. All the buildings were built 1863 as a hospital. From the beginning of the years 1930... it were used as barracks from the German Wehrmacht (Army), special as military-school for "Unteroffiziere" until the end of war. I'm very interested in your reply and I hope you can help with my researches. And please excuse my faults in your language. Sincerely Georg Haberl / Germany. Hello, my name is Leslie Rosenbush. According to several members of my family, my father was interred at Deggendorf D.P. camp post WW II. Would you know where I can turn for a camp list perhaps divulging more information about my father who spoke so little of his wartime experiences in the camps, understandably traumatized by his enslavement and murder of his family. Any help in this direction would be most appreciated. He was in the following camps as well: Budzin, Mielece, Vielicke, Majdanek, Flossenburg and freed by the Russian army at Theresintadt. Do any records or lists survive which may document these interment s either by the Germans or Russians? Where may I turn to? Thank you in advance for whatever help or sources you can provide in my search.p.s. have you heard of a place called "skrent" relating to d.p. interment? Thanx rozebush. Olga's reply: Budzin, Mielece, Vielicke, Majdanek are in Poland. Sumitted by: Wolfgang Strobel, author of Post der befreiten Zwangsarbeiter - Displaced Persons Mail Paid in Deutschland 1945 - 1949. Yours is a wonderful, important website, thank you so much. My family were in 10 different DP camps over 6 years before immigrating to Australia in 1949. My family was in Delmenhorst between June 1948 and June 1949. Here is a photo that shows my Ukrainian mother in a kindergarten photo at Delmenhorst. She is in front of the teacher on the left. A sign can clearly be seen in the background. I love the way that everyone is impeccably dresses and groomed despite their circumstances. A camp newspaper called the Lithuanian Union published Find / Search articles to 'find your relatives' so that the DPs would get help emigrating out of the camps. Dinkelsbuhl has its own page written by John Sklepkowycz who has passed away. Dinkelsbuhl is one of Germany's most picturesque small towns, located in the kingdom of Bavaria, on the Wornitz, 16 m. N. from Nordlingen, on the railway to Dombuhl. Pop. 5000. It is an interesting medieval town, still surrounded by old walls and towers, and has an Evangelical and two Roman Catholic churches. Notable is the so-called Deutsches Haus, the ancestral home of the counts of DrechselDeufstetten, a fine specimen of the German renaissance style of wooden architecture. There are a Latin and industrial school, several benevolent institutions, and a monument to Christoph von Schmid (1768-1854), a writer of stories for the young. The inhabitants carry on the manufacture of brushes, gloves, stockings and gingerbread, and deal largely in cattle. Fortified by the emperor Henry I., Dinkelsbuhl received in 1305 the same municipal rights as Ulm, and obtained in 1351 the position of a free imperial city, which it retained till 1802, when it passed to Bavaria. Its municipal code, the Dinkelsbuhler Recht, published in 1536, and revised in 1738, contained a very extensive collection of public and private laws. 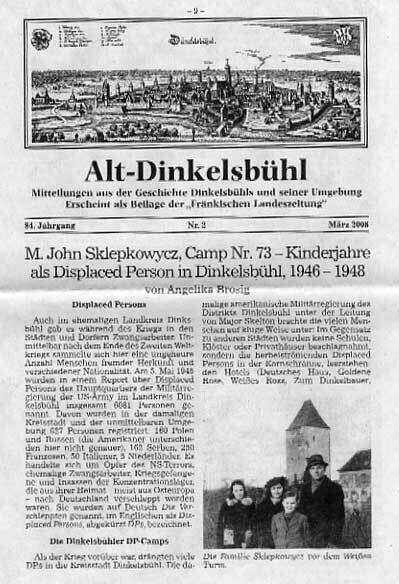 5 May 1945: In a report of Headquarters Military Government - US-Army on Displaced Persons (Kreis DINKELSBUEH) TOTAL 6081 persons of different nationalities were mentioned. So in a continued report on DPs in centers in Dinkelsbuehl and immediate vicinity, TOTAL 627 persons were registered. • Bahnhofsrestauration - (Im Knabsaal), Luitpoldstrasse 19: Here were accommodated the Lithuanian DPs. • Private house, former brush factory: Noerdlinger Strasse 52: Here lived the Ukrainian DPs. all people liked it a lot! Please see the plate for the house where the former synagoue was. SUCCESS! geli - happy - happy - happy! This came in the year book 2008 of the archive in Dinkelsbuehl and it was in the FLZ like this little paper as a special page on 15th March. Donauwörth, See archive in Heilig Kreuz (Holy Cross) . I have read and reread your site on dp camps and concentration camps in Germany, but am unable to find any information that I am searching. My mother was taken from the Polish side of the Ukraine, and taken to Donauworth. There she was chosen by a farmer to work in Riedlingen in 1942. I cannot find a Displaced person camp mentioned in Donauworth. She passed away last March, and I found out that I had an older sister who was born in 1945. She was put in a hospital or children's home in Donauworth and died there in 1946. 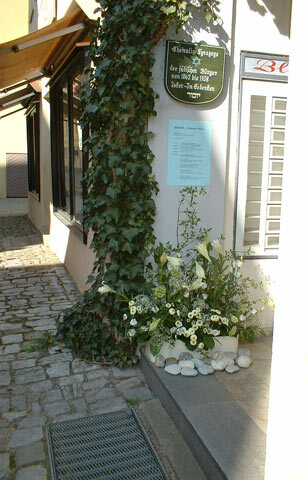 According to my mother she is buried in Riedlingen. But my mother had Dementia before she died and I am wondering if she remembered correctly. I am affected very deeply to think that she died such a lonely devastating death and feel I need to find where the home was and where she is buried. My baptism certificate says I was born in Donauworth, Kath. Stadpfarramt zu U.L.Fr. 8850 Donauworth Kirchhor 3. I wonder if she was born and kept in the same place. Was there a camp there where my mother may have been? Was there a children's home there? Am I able to visit these places if I go there? My research is at a standstill, and I need guidance as to which direction to go. Dornstadt has its own page. We need urgently information on Dornstadt. The actual documentation for this camp is in Israel, "Lochamei Ha Gettaot", but there is little known on the camp. After the use as a children's camp for Jewish children, it was a camp for Ukrainian people. Please try to find more about labour camp in Duisburg. From Parma camp I have a written document (a book) so I know what have interested me. I bought a car few years ago at my friend's shop and we found out that our fathers were together in Parma. He has that book and it was fantastic to see my father's sign on a full list of all prisoners (they were divided in 12 or 14 barracks). A lot of Croats from southern part of Croatia (Dalmatia) joined Tito's partizans and fought against Italian fashists and after fall of Italy against German fashists. My father used to work in a shipbuilding company in Split and was a member of an underground movement in Split. He was present on the meeting (held on 22.06.1941– the day when Hitler started the Russian campaign) when local comunist party decided to organize an armoured uprise against fashists. He passed away at that same date – 22.06.1984. My mother joined partisans on the fall of Italy. She was only 16 at that time and was wounded twice in a combat (she was a nurse). She passed away 3 years ago. Yes, „hr“ in my e-mail stands for Croatia (local name Hrvatska). I have read somewhere that you are of Ukrainian origins?? I used to work in Lviv region and have a lot of friends from there. Ukrainian name for Croatia is Horvatia! DP camps Spakenberg were managed from September 1947 until April 1949 by the International Refugees Organisation area team 907 and DP Assembly centre 1225 in Geesthacht. Please let me know if you would be interested in obtaining hi-res scans ($3 each) or prints ($ 7 each).